BAFTA's, Grammies and soon the Oscars -- there are plenty of opportunities to dust off the tux this time of year! 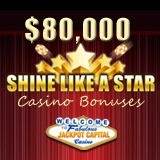 Walk down the red carpet with Jackpot Capital Casino and cash in on $80,000 in casino bonuses during its Shine Like a Star casino bonuses event. Every week until March 15th, $10,000 in weekly Score Board prizes will be awarded and another $40,000 will be given away in random draws. You'll automatically earn points any time you play Jackpot Capital Casino's real-money games on your computer or mobile device. You can win bonuses up to $500 each every week. Bonus Boosts – up to $150 bonuses paid every Friday -- will give you extra playing time and extra chances to get yourself into a higher bonus category. “Sometimes just a few more spins can bump you into a higher bonus category so these Friday Bonus Boosts can make a big difference,” said one regular player. “The more you play the better your chances of ranking for top prize money in the weekly Score Board pay outs,” said Jackpot Capital Casino manager Oliver Smith. “But half of the prize money will be randomly awarded too. Jackpot Capital Casino has hundreds of games from Realtime Gaming. Its mobile casino uses the industry-leading RTG mobile casino platform bringing hit games like Loch Ness Loot, TripleTwister, Aladdin’s Wishes, The Three Stooges II, and Small Fortune to the small screen.